Rare over 100 years ago, aluminum, made by an electrolytic process, is now ubiquitous in transportation, packaging, building construction and electrical transmission. Metallic aluminum was first made by H. C. Oersted in Copenhagen in 1825. He gently heated potassium amalgam (an alloy of potassium and mercury) with aluminum chloride and distilled the mercury from the resultant aluminum amalgam. A small lump of metal having the luster of tin remained behind. In 1845 Fredrick Wohler, at the University of Gottingen, made pinhead size particles of aluminum by reduction of aluminum chloride with potassium. He was not able to fuse them together but he measured their specific gravity and obtained values of 2.50 and 2.67 (g/cm3), quite accurate compared to the current value of 2.702. The low specific gravity, the ductility and the stability in air presaged the future utility of the metal, if it could be made cheaply. H. Sainte-Claire Deville announced an improvement in the process in 1854, that is reduction of aluminum chloride by sodium. The resulting sodium chloride-aluminum chloride melt acted as a flux and allowed the aluminum pin heads to fuse into marble-size globules. Subsequently a plant was built near Paris. Sodium was made by carbothermal reduction. Many others entered the field, in England, Germany, and the United States and improvements were made in the process, but the metal was still expensive. In 1884 a 100-ounce (~2.8-kg) pyramid was cast to cap the Washington Monument, one of the largest pieces ever made at the time. The real breakthrough came in 1886 when Charles Martin Hall in Ohio and Paul L. T. Heroult of Paris independently applied for patents for the electrolytic process in molten salt for manufacturing aluminum. Both electrolyzed alumina (aluminum oxide) dissolved in molten Greenland cryolite (sodium-aluminum fluoride) at about 1000oC (1832oF). The electric dynamo, which came into use about 15 years earlier, allowed this new electrolytic industry to grow and prosper. Aluminum has many remarkable properties, which have driven it to be second in production to iron and steel. Aluminum has a low density, and many strong alloys are produced that contain relatively small percentages of copper, manganese, silicon, magnesium, or zinc. It has a high thermal and electrical conductivity, is non-magnetic, and is highly ductile. Aluminum and its alloys can be cast, rolled, extruded, forged, drawn, and machined. It is commercially available in many forms: plates, sheet, bars, angle- and I-beams, pipe, wire, and foil. Although it is high on the electromotive series and should be an active metal, it is highly corrosion resistant under usual conditions in the atmosphere and in water because it rapidly forms a protective oxide film. Corrosion resistance is enhanced for many applications by producing a thicker aluminum oxide film by anodizing in an electrolyte such as 15% sulfuric acid. Alumina (aluminum oxide) powder, fed to the electrolytic process, is produced by the Bayer process from bauxite ore. Bauxites contain 40-60% alumina, combined with silica (silicon oxide), iron oxide, and titanium dioxide. Bauxite is mined in many places worldwide, for example, Guinea, Jamaica, Brazil, Australia, and Africa. In the Bayer process, the alumina is dissolved in hot sodium hydroxide solution and the iron oxide and other oxides are removed as insoluble "red mud." Aluminum hydroxide is precipitated from the clarified solution by cooling and seeding with aluminum hydroxide crystals. The washed precipitate is calcined at up to 1200oC (2192oF) to produce anhydrous alumina. The particle size of the alumina is about 100 µm (µm = millionth of a meter) and is called "ore" in the electrolytic reduction plants. Fig. 1. 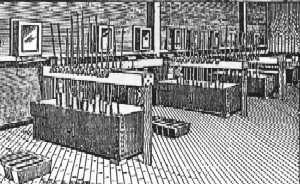 The Pittsburgh Reduction Company's first cell room. Hall and several associates started the Pittsburgh Reduction Company in 1888 in Pittsburgh. They had two electrolytic cells in series, operating at about 1750 amperes and 16 volts across the two cells, producing 50 lb/day (~23 kg/day). The cell line was powered by two steam-powered dynamos in parallel, rated at 1000 amperes and 25 volts each. 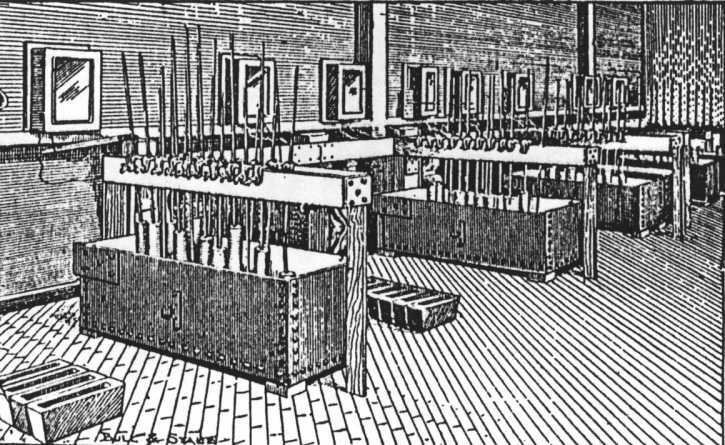 The plant was enlarged to 475 lb/day (~215 kg/day) in 1890 and in 1891 a new plant was built at New Kensington, near Pittsburgh (Figure 1). The new plant produced 1000 lb/day (~453 kg/day) in 1893 and 2000 lb/day (~906 kg/day) in 1894. A new industry was born. 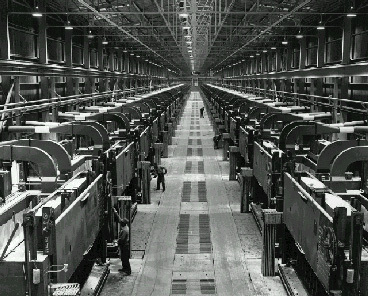 In 1907 the company changed its name to Aluminum Company of America, now known as Alcoa. Plants were built at Niagara Falls and other places where inexpensive water power was available. In 1901 a plant was built in Canada, which later became part of Aluminum Company of Canada, Alcan. Meanwhile the Heroult process was commercialized in France and Switzerland. Other plants were built in England, Germany, Italy, and Norway early in the 20th century where water power was available. Fig. 2. Cross section of a modern prebake anode aluminum reduction cell. Aluminum reduction cells today are of two types: those with prebaked anodes and those with baked-in-place anodes (Soderberg). Both types of anodes are made of baked petroleum coke and coal-tar or petroleum pitch. Prebaked anodes are baked in brick-lined pits and the hydrocarbon off gases can be captured and burned. Soderberg anodes are baked by the heat generated in the cells, and the off gases are more difficult to collect. Environmental restrictions in more advanced countries have halted construction of Soderberg cell plants. Modern cell rooms with prebaked and with Soderberg anodes are shown in Figures 3 and 4. The components of a prebake anode cell are described as follows. A carbon lining contains the bath and a pool of molten aluminum on the bottom. 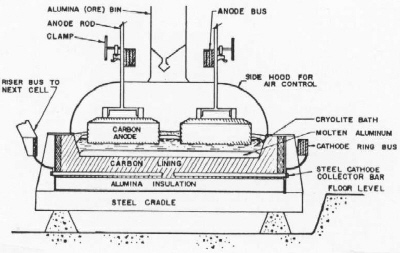 Carbon anodes suspended from an anode bus conduct current into the cell. Anode rods carry the current from the anode bus through steel stubs cast with iron into holes in the tops of the anodes. Current is conducted out of the cell through steel collector bars to the cathode bus and on to the next cell. The aluminum metal pad is the cathode where aluminum is deposited from the bath. Oxygen from the alumina dissolved in the bath combines with the bottom surface of the carbon anode to form carbon dioxide. The anodes are consumed in the process and replacements are added at individual locations on a regular schedule. The anode butts are sent back to the anode plant to be ground and mixed into new anode paste to be pressed and baked. Aluminum is siphoned out of the cells on a daily basis into vacuum crucibles and sent to the cast house. The carbon lining is contained in a steel shell with a thermal insulation of alumina or insulating brick. Fig. 3. Electrolytic cell for 300 kA prebaked carbon anode technology in the cell room (Courtesy of Jon H. Magnussson, Altech, Reykjavik, Iceland). Fig. 4. Soderberg electrolytic cell line - Kaiser Chalmette plant (Courtesy of Jon H. Magnussson, Altech, Reykjavik, Iceland). In operation, cryolite freezes on the sidewalls of the cells forming a "ledge" which protects the sidelining from severe attack by aluminum and molten cryolite. Cryolite also freezes over the top of the bath and forms a "crust" to support a top layer of alumina thermal insulation. Alumina is fed to the bath through holes punched in the crust. The carbon dioxide exits through holes in the crust and is collected under the hoods. The carbon dioxide and air leaking in is now ducted to dry scrubbers which remove fluorides from the gas stream. Fresh alumina contacting the gases removes the hydrogen fluoride and evaporated fluoride particulate. This alumina, fed to the cells, returns fluoride to the cells. The hydrogen fluoride comes from residual hydrocarbons in the anodes and trace water in the alumina and air humidity reacting with the fluoride bath. Control of alumina concentration in the cells is accomplished by a slight underfeeding. When the alumina reaches a critical level the cell goes on anode effect, caused by a limiting rate of diffusion of alumina to the anode surfaces. The cell voltage then rises and some fluorocarbons are generated. A light bulb connected across the cell lights up with increased cell voltage as a signal for the operators to feed the cell with alumina and kill the anode effect. Cells now run a day or longer between anode effects. The ratio of sodium fluoride to aluminum fluoride in the cryolite bath changes over time and corrective additions are added based on laboratory analyses. Fig. 5. Development of increasing new cell size with time. Fig. 6. Improvement in energy efficiency. 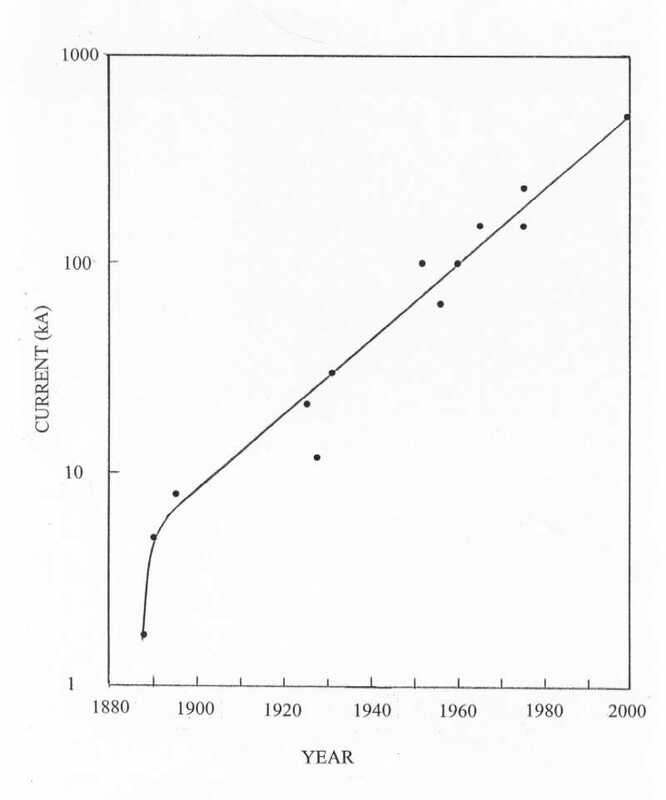 Since inception of the process, cells in new plants have increased with time as illustrated in Figure 5. This increase is driven by a need to reduce labor costs and to increase energy efficiency. On the average, cell size has doubled about every 18 years in the 20th century. 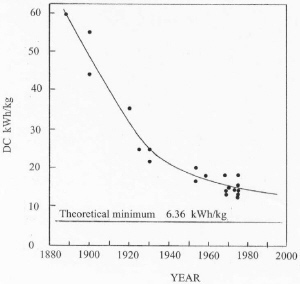 As a result of increasing cell size and better process control, energy consumption has improved with time as shown in Figure 6. 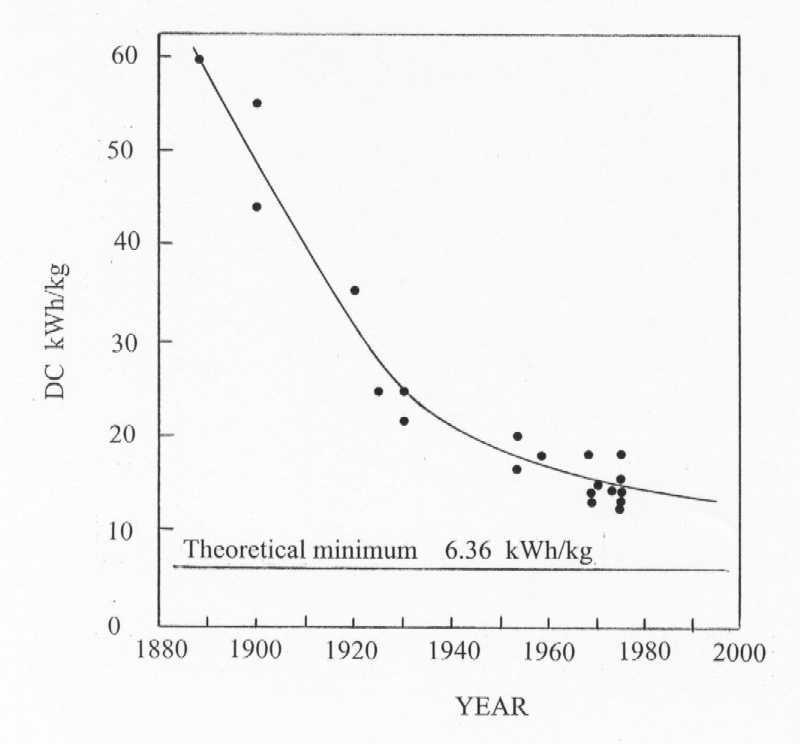 Energy efficiency is approaching about 50% based on the heat of reaction for the cell reaction. Significant further improvements in energy efficiency may be hard to achieve with the existing cell design. As cells have become larger, electromagnetic effects caused by interaction of the current through the cell with the magnetic field of the bus work have resulted in swirling of the metal pad and vertical distortions in the metal-bath interface. This effect has limited the minimum anode-cathode distance (ACD) to about 4.5 cm because of spurious short circuits by metal contacting the anodes. Since a major voltage drop in the cell is caused by bath resistance, this effect limits energy efficiency. Energetically this reaction requires a one-volt increase in the cell, but this is partially offset by a lower anode overvoltage. 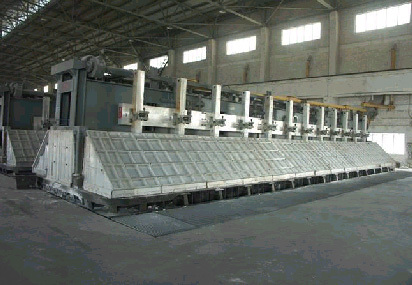 The saving would be in eliminating the manufacture and changing carbon anodes. The production of greenhouse gases, carbon dioxide and fluorocarbons in the cells, would be eliminated. By combining titanium diboride cathodes and non-consumable anodes as vertical electrodes the anode-cathode spacing could be further decreased and cell voltage could be less than for the conventional Hall-Heroult cells. In the past half century there have been a number of attempts at alternatives to the Hall-Heroult process. Several alternatives have been developed almost to industrial scale, then abandoned because of technical problems and lack of overall economic advantage over the Hall-Heroult process. In the 1960s Alcan developed a carbothermic subhalide (aluminum monochloride) process. Bauxite or low-grade ores were reduced with carbon and the resulting impure aluminum was purified with an aluminum sub-chloride process. It turned out that the energy costs were higher than for the Hall-Heroult process and severe corrosion problems were encountered. The Toth Company in the same period did a carbothermal chlorination of clay and reduced the aluminum chloride produced with manganese. The manganese chloride formed was converted to manganese oxide and chlorine with air. The chlorine was recycled and the manganese oxide carbothermally reduced to manganese and recycled. A manganese-aluminum alloy formed that was uneconomical to separate. Alcoa had a large-scale development program in the 1970s for an aluminum chloride (aluminum trichloride) process. Alumina was carbothermally chlorinated to aluminum chloride which was electrolytically decomposed to aluminum and chlorine in bipolar cells with graphite electrodes. It was said that the cells worked well but there were technical problems with the plant to produce aluminum chloride. Thus the Hall-Heroult process remains to be displaced. Fig. 7. 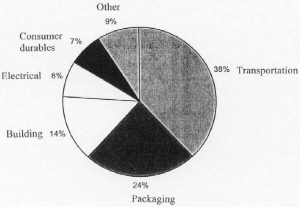 U.S. consumption of aluminum in 1999. Worldwide aluminum capacity in December 1997 was 24,302,000 metric tons/yr, of which 1,861,900 tons/yr was shut down. The United States capacity was 4,215,000 metric tons/yr, of which 654,000 tons/yr was shut down. The United States once had a more dominant position but new reduction plants have been moving to countries with less expensive hydro and coal power such as Norway, Brazil, Venezuela, and Australia. 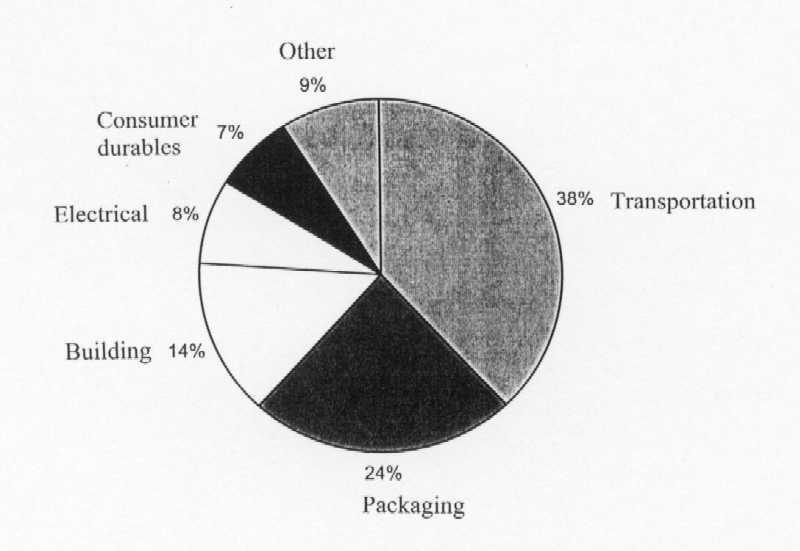 The distribution of consumption of aluminum in the United States in 1999 is shown in Figure 7. Aluminum the Magic Metal, T. Y. Canby, "National Geographic" August 1978. 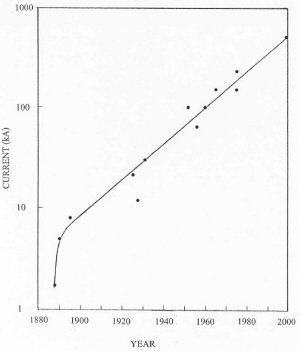 The Primary Aluminum Industry at the Turn of the Year 1997/98, R. P. Pawlek, "Light Metals Age" p 8, February 1998. Aluminum Electrolysis (2nd Edition), K. Grjotheim, C. Krohn, M. Malinovsky, K. Matiasovsky, and J. Thonstad, Aluminium-Verlag, Dusseldorf, 1982. Aluminum and its Production, J. D. Edwards, F. C. Frary and Z. Jeffries, McGraw-Hill, New York, 1930. Process of reducing aluminium by electrolysis, C. M. Hall, US Patent, No. 400,766, 1889. Available on the WWW. 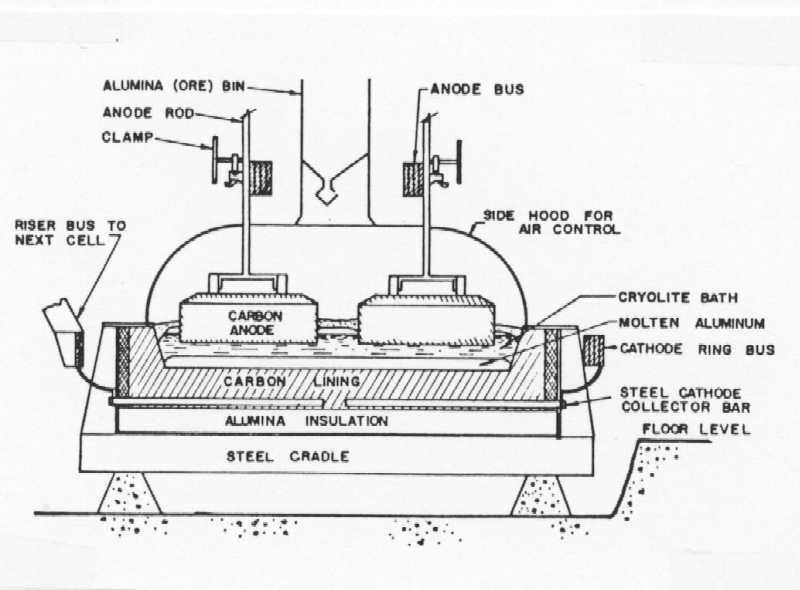 Process of electrolyzing fused salts of aluminium, C. M. Hall, US Patent, No. 400,667, 1889. Available on the WWW. Process of reducing aluminium from its fluoride salts by electrolysis, C. M. Hall, US Patent, No. 400,664, 1889. Available on the WWW. Process of preparing aluminium bronze and other alloys, P. L.-T. H�roult, US Patent, No. 387,876, 1888. Available on the WWW. Recherches sur les m�taux, et en particulier sur l'aluminium et sur une nouvelle forme du silicium, H. E, S,-C. Deville, �Annales de chimie et de physique� Ser. 3 Vol. 43. pp 5-36, 1855. Available on the WWW. Notiz �ber elektrolytische Gewinnung der Erd- und Alkalimetalle, R. W, Bunsen, �Annalen der Physik und Chemi, Leipzig� Vol. 168, (Ser. 2, Vol. 92, Ser. 4, Vol. 2) pp 648-651, 1854. Available on the WWW.